According to Bloomberg, parliament’s petitions website repeatedly crashed late Wednesday as thousands of Britons, inspired by a string of celebrity endorsements, flooded the site and signed the petition. Celebrities who shared the petition included Annie Lennox, actor Hugh Grant, science broadcaster Brian Cox and comedian David Mitchell. The rush was the highest rate of signing that the site had ever handled, and it crashed multiple times (though that clearly didn't stop people from signing the petition). 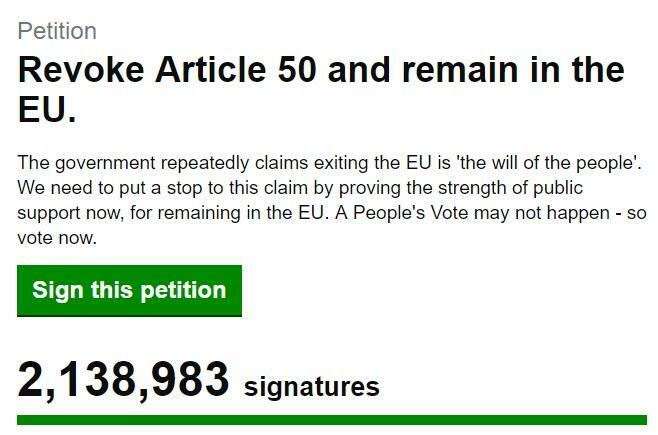 Since last night, more than 2,100,000 people have signed the petition. Parliament is obliged to consider any petition with more than 100,000 signatures for debate. The government is also obligated to issue a response.